From time to time I get e-mail to the effect that someone is writing a paper, formulating a debate, or for whatever reason want to reference this site and to cite credentials regarding my background. So here you go. I have a Masters in Electrical Engineering from Purdue University, and have worked for 30 years in medical diagnostic imaging (with GE Healthcare). These are like CAT scanners, MRI scanners, Nuclear Medicine, X-Ray and Ultrasound machines. Right now I am the principal engineer for system design of Computerized Axial Tomograpy (CAT) scanners and Positron Emission Tomography (PET) scanners. You can get additional information on medical diagnostic imaging at the GE Healthcare web site and you can find out more about these imaging modalities on Wikipedia, CAT Scanners are here and PET here. I've followed an interest in Space Exploration and rocketry since I was in high school - my Senior english paper was a report on the space program focused on the Apollo 11 moon landing (which had just happened). I am a Boy Scout merit badge counsellor for Space Exploration and Astronomy, and I maintain this web site with over 50 pages on various topics relating to Astronomy, Space Exploration, rocketry and aerospace physics and design. 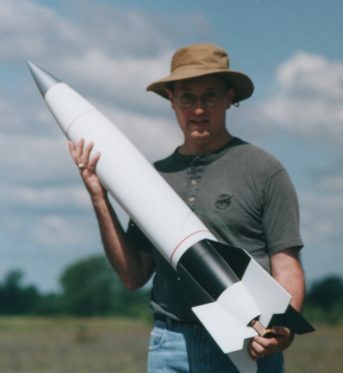 I'm a member of the Tripoli Rocketry Association and am certified level 2 (can launch rockets with up to L motors). That's my level two rocket in the picture, a 5.5" diameter LOC V2.